Have all the ingredients at room temperature. Position a rack in the lower third of an oven and preheat to 350° F. Grease and flour three 9-inch round cake pans and place a round of parchment paper inside each pan. Over a large sheet of waxed paper, sift together the flour, baking powder, and salt. Set aside. In the bowl of an electric mixer fitted with the flat beater, beat the butter on medium speed until smooth and creamy, 1 minute. Add the sugar in a slow, steady stream and beat until the mixture is light and fluffy, 4 to 5 minutes; stop the mixer occasionally and scrape down the sides of the bowl. Add the eggs 1 at a time, beating well after each addition. Continue beating until fluffy, white and increased in volume, 3 to 4 minutes; stop the mixer occasionally to scrape down the sides of the bowl. Beat in the vanilla. Reduce the speed to low and add the flour mixture in four additions, alternating with the milk and beginning and ending with the flour, beating until smooth after each addition; stop the mixer occasionally and scrape down the sides of the bowl. Pour about 1/3 of the batter (4 1/2 cups) into a medium bowl, add the chocolate and stir until blended. To form the checkerboard pattern, place the divider ring in one of the prepared pans and spoon the plain batter into the outer and center rings, filling them half to two-thirds full. Spoon about 1 cup of the chocolate batter into the middle ring. Gently lift the ring out of the pan and scrape any remaining plain batter from the ring into the large bowl of plain batter; scrape any chocolate batter into the bowl of chocolate batter. Then place the ring in the second pan and repeat the procedure with the plain and chocolate batters. For the third cake pan, reverse the procedure: place the ring in the pan and spoon the chocolate batter into the outer and center rings. Spoon about 1 cup of the plain batter into the middle ring. It's important that each layer have approximately the same amount of batter so that they are the same thickness when baked. Gently lift the ring out of the pan and scrape any remaining plain batter from the ring into the other circles of batter, if needed to even out the layers. Do the same with any remaining chocolate batter, if needed. Set the pans on the same rack in the oven, if possible, and bake until the tops of the cakes spring back when gently pressed without leaving an impression, 25 to 30 minutes. The chocolate cake will done a bit sooner than the plain; that's okay. Do not over bake, or the chocolate cake will be dry. Transfer the pans to wire racks and cool for 10 minutes. Tap gently to see if the cakes are releasing from the sides. Place another rack on top of one cake pan, invert, and carefully remove the pan. Place the other rack on the cake again and invert right-side up. Follow the same procedure for the other two cakes. Cool the cakes completely before assembling and frosting. Serves 10 to 12. To make the frosting, in a food processor combine the confectioner's sugar, salt, and butter and process to combine. Add the milk and vanilla and process until smooth. Add the chocolate and process until well blended, smooth, and creamy. Use the frosting immediately. To create the checkerboard effect, stack the cake layers so the outside colors alternate. The frosting between each layer should be thin enough to complete the checkerboard pattern. 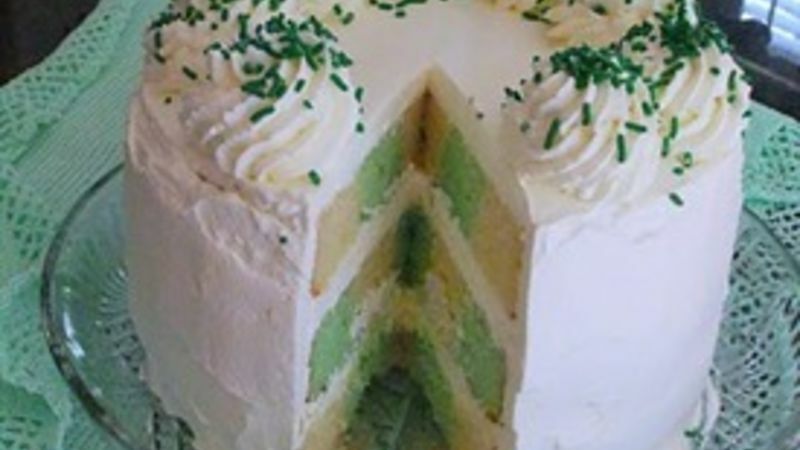 To assemble the cake, place a cake layer, bottom side up, on a cake circle and spread about 2/3 cup frosting all the way to the edges of the layer. Place a second layer, top side up, on top and spread about 2/3 cup frosting all the way to the edges of the layer. Place the third layer on top, top side up, and spread the remaining frosting on the sides and top. Decorate the cake as desired.